Soria - situated on the Rio Duero in the east of the autonomous community, the city is noted for its walls and a number of architecturally distinctive churches. These include the Plateresque Concatedral de San Pedro and its cloister, the convent church of Santo Domingo, and the unique architectural mix of the ruined cloisters of San Juan de Duero, on the other side of the river from the old town. A few kilometres north of the town are the ruins of Numantia, a Celtiberian town whose inhabitants destroyed it rather than let it fall to Scipio. In Soria is the Museo Numantino, devoted to the archeological remains of this site. The city's professional football club is called CD Numancia. 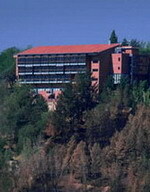 Modern 3 star hotel located at the outskirts of Soria, in the middle of nature. From the rooms you will be able to gaze at Numancia and the Monte Valonsafero with its Frentes peak that you can see in our picture of the hotel. The Hotel Campos de Castilla is not overcrowded and is specialized in personal services. The hotel has 20 rooms with views to the landscape and luminous windows. They are modern and functional and all have en-suite bathrooms. 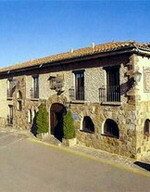 Hotel with enchantment in Soria. The Leonor Hotel is in the beautiful parque del Mirón (park of the Onlooker), from where there is a beautiful panoramic view on the Duero river, Monte de las Ánimas and the old town of Soria. 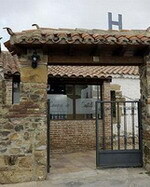 Located on the way to the city centre, this charming establishment is located in a beautiful large stone house. The hotel has capacity to hold meetings, events or banquets and has a superb restaurant, bar, elegant social hall and connection to Internet in all the public areas. A cosy and familiar hotel - your home from home in Soria. The Leonor Hotel offers 32 warm and comfortable completely equipped rooms. The Parador de Soria rises up on a privileged height from which the extraordinary panorama of this monumental town and of the Duero river can be contemplated. The hotel offers rooms that are provided with modern furnishing in pine wood and are equipped with modern amenities. You can dine at the onsite restaurant, which serves regional specialities in a cosy atmosphere. Conference facilities are available for people on business travel. The area where the parador is located enables guest to practise many activities such as trekking, climbing, canoeing, guided routes and many others.